San Francisco has an all-consuming obsession with food (pun intended…) Whether it’s pizza served from the back of a shipping container turned kitchen-on-wheels (complete with a wood-burning oven), or queuing for a delicious gourmet meal, this city’s food scene never fails to serve up options. Starbelly: This place is always busy, but they do have a communal table and they take reservations (recommended!) The pizzas are awesome, and we had an amazing bottle of 2010 Sauvignon Blanc by Medlock Ames here. Their “Small” plates are tasty but a little overpriced in my opinion – might as well go for pizza or something from their larger “Plates” selection. Nopa: This place is a serious San Francisco institution. We went earlier this week, without reservations, and even though the place was packed (on a Tuesday! ), we were seated right away at the chef’s table (a.k.a. bar seats facing the open kitchen.) As we sipped a delicious glass of Bedrock “Ode to Lulu” rosé, the gentleman in chef whites standing next to us (and coordinating the onslaught of orders coming into the kitchen) introduced himself as Laurence. When he found out we live around the corner, he welcomed us to the ‘hood, and made us feel genuinely at home. Turns out he’s Laurence Jossel, chef and co-owner. I’m still impressed with his ability to tell a funny French-Canadian joke and stay focused on the job. I had an amazing halibut dish as a main, but it was the Chocolate Pot du Crème that really stole my heart. 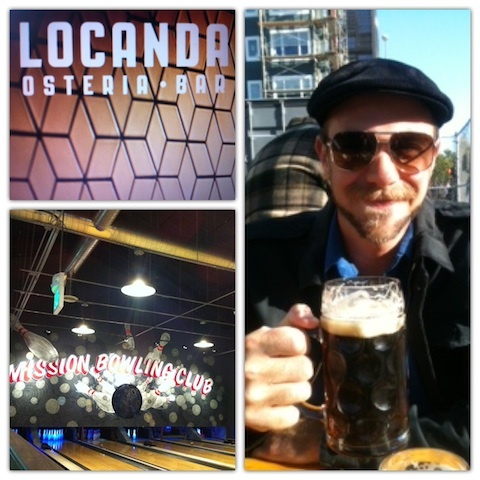 Mission Bowling Club: At this hipstery establishment in the heart of the Mission, the six bowling lanes are just a side dish to the awesome restaurant. I had the best veggie burger I’ve ever eaten here. No joke, it was really that good. The restaurant service was great, but if you happen to be bowling and drinking, good luck coaxing a pint from the surly bartenders. Biergarten: This traditional German beer garden is operated by the fine folks at Suppenküche (also highly recommended – you can drink beer out of a giant glass boot!) and is located in Hayes Valley’s Proxy, probably my favourite part of the city. A rotating selection of German beer and delicious warm pretzel – what’s not to love? Locanda: Order the Jewish-style artichokes, you won’t be disappointed, I promise. The food was all-around delicious, and the attentive, friendly service didn’t hurt either. Their Business Thyme cocktail (gin, thyme, honey, lemon) also made for a delicious diversion as we waited at the bar for our table.